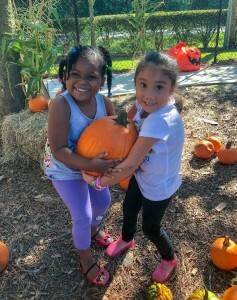 Nearly 270 Guadalupe Center students had an opportunity to scour a pumpkin patch before Halloween in search of the perfect pumpkin, thanks to an expanded partnership with an Immokalee grower. HM.CLAUSE, a global seed company with a research station in Immokalee, created a temporary pumpkin patch at Guadalupe Center so students in the Early Childhood Education Program could learn about the life cycle of fall’s favorite fruit. As children retrieved their own pumpkin to bring home, the company formalized plans to donate soil and vegetable plants to expand the children’s garden at Guadalupe Center, in addition to providing fresh vegetables for the kitchen. Guadalupe Center’s mission is to break the cycle of poverty and create endless opportunities through education for the children of Immokalee. The nonprofit organization offers an Early Childhood Education Program, an After-School and Summer Enrichment Program and the college preparatory Tutor Corps Program. HM.CLAUSE is a global vegetable seed company dedicated to meeting local needs through global diversity, and is committed to innovation inspired by worldwide partnerships in the scientific, industrial and commercial fields. An innovative company whose core business is plant breeding, HM.CLAUSE specializes in the development, production and sales of vegetable seeds worldwide. In 2008, Harris Moran Seed Company (USA) and Clause (France) were grouped together under the HM.CLAUSE Business Unit of Limagrain. HM.CLAUSE employs more than 2,800 people full-time located in over 30 countries around the world. Its investments in research and breeding represent 15 percent of annual sales. The organization coordinates breeding for 24 species and has more than 800 people actively engaged in research and development activities. Limagrain is an international agricultural co-operative group, specializing in field seeds, vegetable seeds and cereal products. Founded and managed by French farmers, Limagrain is the 4th largest seed company in the world. Guadalupe Center is a purpose-driven, nonprofit organization with proven results in creating endless possibilities for the students of Immokalee through education and fostering personal and academic success that leads to economic independence. With a focus on breaking the cycle of poverty through education, Guadalupe Center is proud of the children’s accomplishments: 94 percent meet or exceed kindergarten readiness measures, 100 percent of Tutor Corps high school seniors graduate high school and are accepted into college, and more than 90 percent graduate with a post-secondary degree.